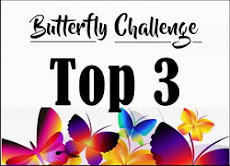 Butterfly Challenge: #115 Spin The Butterfly Wheel with the Letter Y. Do love colour combos though. Actually used yellow and yew on my butterfly card on last post, which didn’t make it but as it’s back dated can’t include still it’s an idea! Great wheel! I will give this one some thought. Thank you for putting my card in the Top 6. Lovely new wheel, and lovely inspirations too! Great cards! Sorry I've been a bit lax with this challenge but I've made it this time. Playing for fun only. Beautiful creations Mrs A, love the flowers and butterflies! 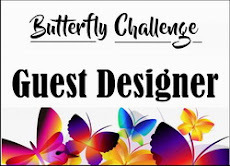 I would love a chance to win. I wasn't sure about the colors on your wheel and then I looked through my stash and had a whole paper pad with variations of these colors. I was so lucky! Beautiful cards. I'm so glad I had a chance to enter this time. 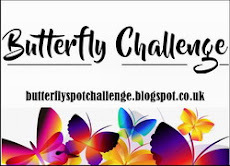 I always intend to play in the Butterfly Challenge but time gets away from me all too often. This time I made a point of playing. 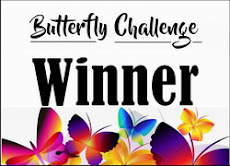 Mrs. A., Thanks for the fun challenge. Pretty cards, Mrs. A! Lovely dies used on the first card & love the stitching. And those flowers are just gorgeous on the 2nd card. Your cards are lovely, as always, Mrs. A! I adore the ombre stitching and the lovely diecuts. Beautiful.